Epifanio Salas was born In Mexico in January, 1841. He married Tiburcia Estrada circa 1865. The couple and five children immigrated to the United States in 1878, probably from the vicinity of San Carlos, Chihuahua, Mexico. By 1880 they were settled in the Comanche Springs area of Pecos County, where Epifanio was working as a laborer. Epifanio’s wife Tiburcia apparently died sometime in the early 1880’s and circa 1889 he married Juliana Leyva. Epifanio and Juliana had no children. By 1900 Epifanio and Juliana had settled in the San Vicente area, where Epifanio was working as a ranchman according to the census. Probably in 1902 he purchased Section 8 of Block 18 and in 1904 (perhaps earlier) he was farming portions of Sections 8, 9 and 10 of Block 18. By 1910 he and Juliana had moved to the Marathon area, where Epifanio was working as a farmer. 1. Daughter Remedias Salas was born circa 1866 in Mexico. In 1880 she was living with her parents in the Comanche Springs area. 2. Daughter Juana Salas was born circa 1867 in Mexico. In 1880 she was living with her parents in the Comanche Springs area. On May 26th, 1886 she married Pedro Salmon at Jesus Nazareno Temple in Ojinaga, Chihuahua, Mexico. He was the son of Gregorio Salmon and Marcela Tercero. 3. Son Dionisio Salas was born on April 8th, 1868 in Mexico. In 1880 he was living with his parents in the Comanche Springs area. Circa 1897 he married Cornelia Gamboa and in 1900 they were living in the Fort Stockton area with two daughters. At that time he was working as a farm laborer. According to the 1900 census, Dionisio had become a U.S. Citizen by that time. Probably later in 1900 Dionisio and his family moved to San Vicente, Texas. From 1900 through at least 1904 he owned a herd of 100 goats. In the 1910 census his occupation is shown as “laborer, odd jobs” and in 1920 as “laborer, general”. Cornelia died sometime between 1921 and 1930 and by 1930 Dionisio had moved to Marathon. In April 1930 he was working as a cook for a sheep shearing crew. Dionisio died in Marathon on July 23rd, 1932 and is buried in the Marathon Cemetery. A. Daughter Isabel Salas was born in Texas on July 8th, 1897 and was baptized in Marathon, Texas on April 22nd, 1898. She married Jose “Joe” White October 27, 1919. He was a Private First Class in the 27th Company, 165th Depot Brigade during World War One. After their marriage Isabel and Joe lived in Marathon, where he worked as a ranch hand. Isabel died in Alpine April 21st, 1932 and Joe died in Alpine May 9th, 1932. Both are buried in Marathon (a). After their deaths, their two children were raised by Isabel’s sister Canuta and her husband Manuel Aguilar. (1). Son Manuel White was born August 18, 1920 in Marathon. (2). Daughter Isabel White was born July 7, 1923 in Marathon. (1) Son Elias Salas was born in Brewster County on July 6th, 1926. (2) Son Epifanio Salas was born in Brewster County on September 21st, 1928. (3) Daughter Flororalia Salas was born in Brewster County on January 21st, 1941. D. Daughter Canuta Salas was born in San Vicente. Her birth date in her birth certificate is May 3rd, 1904 and in her baptism record is 29 January 1904. She was baptized by Father Brocardus in San Vicente on May 28th, 1905. Her godparents were Eustolio Rivera and Adelaida Gamboa. Canuta married Manuel Aguilar of Marathon August 15th, 1925. He was the son of Tomas Aguilar and Felipa Sosa. Manuel was born and baptized in Terlingua. He moved to Marathon with his family and in 1920 was working in his father’s blacksmith shop. Later he worked as a sheep shearer. 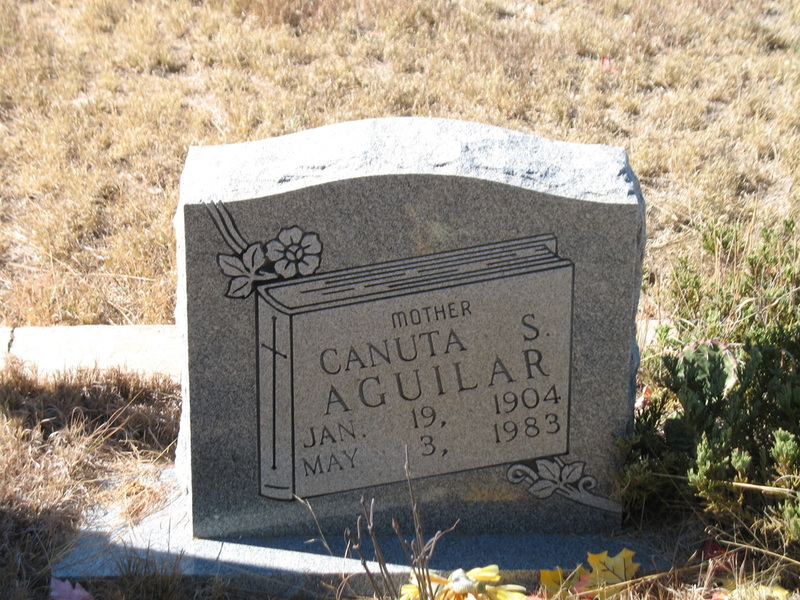 Canuta died in Brewster County on May 3rd, 1983. Manuel died in Brewster Memorial Hospital, Alpine on October 24th, 1972. Both are buried in the Marathon Cemetery. (1) Daughter Carolina Aguilar. Her birth date and place are not available. a. Daughter Maria Consuelo "Connie" Aguilar Portillo was born May 12th, 1956 in Fort Stockton. d. Son Dario Javier Aguilar Portillo was born August 29th, 1964 in Alpine. 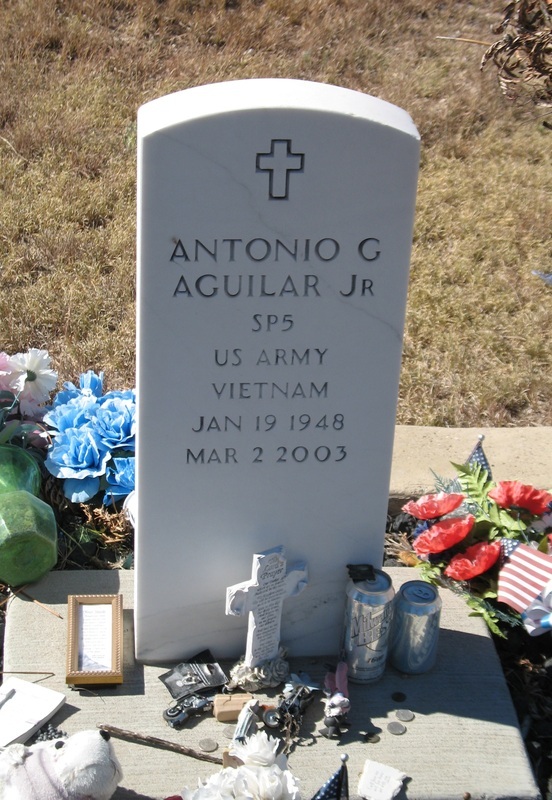 (3) Son Antonio Aguilar, Sr. was born July 17th, 1928 in Brewster County. On October 28th, 1946 he married Sara Garcia, the daughter of Matilde Garcia and Teodora “Ma Lola” Granado. Antonio died in Odessa February 11, 1986 and is buried in the Marathon Cemetery. Sara was living in Odessa in November 2004.
a. Daughter Jo Ella Aguilar married David Bewley. In November 2004 they were living in Odessa, Texas. b. Daughter Glynda Aguilar married Bill Gonzales. They were living in Lubbock, Texas in November 2004.
d. Daughter Gina Aguilar married James McCormack. In November 2004 they were living in Monahans, Texas. e. Son Antonio Aguilar, Jr. was born January 19th, 1948 in Marathon, Texas. He was a veteran of the Viet Nam Conflict and later worked for Big Bend National Park. He died in a motorcycle accident on U.S. Highway 385 about 12 miles south of Marathon on March 2nd, 2003 and was buried in the Marathon Cemetery on March 5th. E. Daughter Juana Salas was born July 12th, 1907 in San Vicente, Texas and was baptized there by Father Brocardus on April 26th, 1908. Her godparents were Clemente and Susana R. Mena. She married Abel Rodriguez January 17th, 1925. In 1930 they were living in Marathon and Abel was working as a sheep shearer. At one time Abel accidently became a member of the cast in the movie Giant, being filmed in Marfa, Texas. His truck was parked outside a snack bar in Marfa where a fight scene was being filmed. Unaware of the filming, he went to get his truck and forever became part of the scene. F. Daughter Teresa Salas was born on August 24th, 1909. She was baptized in San Vicente by Father Brocardus on October 2nd, 1910. Her godparents were Clemente Mena and Susana Rodriguez. In 1930 she was living with her father in Marathon and was working for a private family. She married Pablo Rodriguez July 28th, 1945. G. Son Eugenio Salas was born September 3, 1911, probably in San Vicente. In 1930 he was living in Marathon with his father and was working as a sheep shearer. During World War II he was a medic with the U.S. Army. He saw service in Italy, France and North Africa and was awarded the Silver Star, the Bronze Star, and the Purple Heart. On January 28, 1945 he married Josefina Salmon in Marathon. She was born in Texas December 24, 1911 , the daughter of Refugio Salmon and Sara Terrazas. Soon after their marriage Eugenio and Josefina, along with her parents, moved to San Antonio. Eugenio died in San Antonio November 19, 1984 and Josefina died there November 10, 2000. Eugenio and Josefina had four children. (1) Daughter Anna Marie Salas was born July 15, 1946 in San Antonio. Her married name is Romo. (2) Daughter Cornelia Salas was born February 13, 1949 in San Antonio. She married Timothy L. Tolley in San Antonio June 20. 1982. (3) Son Roberto Salas was born March 21, 1952 in San Antonio. (4) Daughter Maria Antonieta Salas was born September 19, 1954 in San Antonio. Her married name is Luna. H. Daughter Rita Salas was born in circa 1914, probably in San Vicente. In 1930 she was living with her father in Marathon and was working for a private family. (1) Rafael White was born on August 18th, 1934 in Brewster County. (2) Daughter Bernarda Alisia White was born on July 5th, 1936 in Brewster County. (3) Son Fidel White was born on March 22nd, 1938 in Brewster County. J. Concepcion Salas was born circa 1921 in Texas. In 1930 she was living with her father in Marathon. A. Son Manuel Salas was born December 27, 1902 and was baptized in Terlingua February 16, 1903 by Father Brocardus. In 1910 he was living with his mother in Marathon. B. Daughter Basilia Salas was born March 22, 1903 in San Vicente and was baptized there May 20, 1903 by Father Brocardus. Her godparents were Martin Ybarra and Paula Salmon. In 1910 she was living with her mother in Marathon. C. Daughter Norata Salas was born April 6, 1905. She was baptized May 28, 1905 in San Vicente by Father Brocardus. Her godparents were Julian Sanchez and Paula Salmon. In 1910 she was living with her mother in Marathon. D. Daughter Isabel Salas was born November 19, 1905. She was baptized September 26, 1906 in Terlingua by Father Brocardus. In 1910 she was living with her mother in Marathon. A. Daughter Guillerma Gonzales was born in Marathon June 25, 1911. B. Daughter Antonia Gonzales was born in San Vicente May 17, 1914. A. Daughter Margarita Salas was born in Texas in 1900. In 1910 she was living with her parents in the San Vicente area. In 1920 she was living in San Vicente with her widowed mother in the home of her maternal grandmother and step-grandfather. a. Daughter Carolina “Carol” Silvas was born February 10, 1947 in Brewster County. Her married name is Chavez and in February 2008 she was living in Odessa. b. Son Alfredo Silvas, Jr. was born April 12, 1949 in Brewster County. In February 2008 he was living in Odessa. c. Son Frankie Silvas was living in Odessa in February 2008.
d. Son Edward “Eddie” Silvas was living in Odessa in February 2008.
e. Daughter Mary Silvas was living in Odessa in February 2008.
f. Daughter Gloria Silva was living in Odessa in February 2008.
g. Daughter Diana Silvas was living in Odessa in February 2008.
h. Daughter Linda Silvas. Her married name is Trevino. In February 2008 she was living in San Antonio, Texas. i. Daughter Debbie Silvas. Her married name is Melendez. In February 2008 she was living in Midland, Texas. (2) Daughter Manuela Salas was born in San Vicente in 1925. She was living in Alpine, Texas in February, 2008.
a. Daughter Rosa Alva Ramos was born in Brewster County on October 27, 1948. (4) Daughter Epifania Salas was born in San Vicente in 1930. Her married name is Juardo. In February 2008 she was living in Pecos, Texas. (5) Daughter Juana Salas was born in San Vicente on February 6th, 1932. (6) Son Fermin Salas, Jr. was born in San Vicente on June 2nd, 1935. In February 2008 he was living in Alpine, Texas. 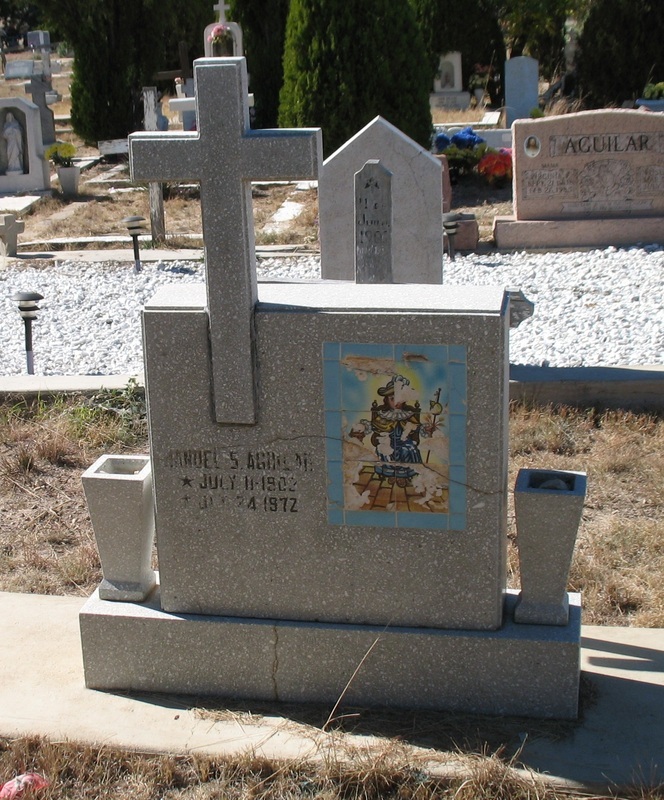 (1) Son Sotero Salas was stillborn in San Vicente on 22 April 1935 and was buried there the same day. a. John Robert Salas was born in Alpine December 28th, 1961. He died in Memorial Hermann Southwest Hospital, Houston, Texas on July 25th, 2009 and was buried in the Marathon Cemetery on July 29th, 2009.
b. Daughter Terrie Salas. She was living in Marathon in July, 2009.
a. Daughter Yvonne Fierro Salas was born in Texas September 39th, 1963. She died in Brewster County Memorial Hospital October 8th, 1963 and is buried in Holy Angels Cemetery. (4) Son Pablo Salas was born in Brewster County on March 2nd, 1945. (5) Son Cirilo Salas was born in Brewster County on March 18th, 1949. D. Son Benito Salas was born in San Vicente on April 3rd, 1906. He was baptized in San Vicente on February 27th, 1907 by Father Brocardus. His godparents were Adolfo Yharte and Wencelada Macias. In 1910 he was living with his parents in the San Vicente area. In 1920 he was living in San Vicente with his widowed mother in the home of his maternal grandmother and step-grandfather. E. Daughter Maria Belen Salas was born in San Vicente on March 17th, 1908. She was baptized in San Vicente by Father Brocardus on April 26th, 1908. Her godparents were Adolfo Yharte and Wencelada Macias. In 1910 she was living with her parents in the San Vicente area. In 1920 she was living in San Vicente with her widowed mother in the home of her maternal grandmother and step-grandfather. (1) Son Francisco Ortega was born in Brewster County on June 17th, 1940. He married Amelia “Emily” Gomez July 14th, 1962. In September 2002 they were living in Marathon. (2) Daughter Rosa Ortega was born in Brewster County on August 29th, 1944. (3) Son Ruben Ortega was born in Brewster County on August 26th, 1947. He died of pneumonia in Marathon January 27th, 1953 and is buried in the Marathon Cemetery. (4) Son Palomino Ortega was born in Brewster County on Jun 27th, 1949. (5) Son Jesus Ortega was born August 7th, 1951 in Texas. He was born prematurely and died August 16th, 1951. He is buried in the Marathon Cemetery. 3. Daughter Tomasa Salas was born circa 1879 in Texas, probably in the Comanche Springs area. (a) According to a family story, Isabel and Joe died within a month of inhaling fumes from a buried treasure they found between Alpine and Fort Stockton.